These DIY ugly Christmas sweater ideas are a great way to show off your creativity and skip those store-bought ugly sweaters that everyone else will be wearing to this year's holiday party. You'll find more than just photos here, there are complete instructions on how to make these easy ugly Christmas sweaters. Each link includes the supplies you need and how you can put them all together to make the ugliest holiday outfit yet. These DIY ugly Christmas sweaters go together quickly and use supplies that won't break the bank. You'll have some of the supplies already and home and others can be picked up at dollar stores, thrift stores, craft stores, and even garage sales. If you're hosting an ugly Christmas sweater party, you'll want to check out these free holiday party invitations and include some fun Christmas party games to make sure your guests have a blast. This DIY ugly Christmas sweater is for the true cat lover, decorated with cats of all shapes and sizes jumping out of mittens. You can complete the look by adding a stuffed animal to sit on your shoulder. A list of what you'll need is available including fabric paint, mittens, and glue. There are lots of color photos included that show you exactly how to make the sweater including drawing the cats with the fabric paint. This ugly Christmas sweater takes it to the next level because it includes working lights. Most of the materials can be picked up at the dollar store which includes pom-poms, jingle bells, tinsel, lights, and felt. There are lots of photos to help you DIY this sweater but you can, of course, add or take away anything to make it truly yours. Big Lots has a free ugly sweater Christmas project that will get you a lot of attention at your next holiday party. It takes a cardigan or jacket which you completely cover with garland topped with ornaments and bows. The more the better with this Christmas sweater. This is an easy DIY project that you can make in just a few hours from start to finish. This DIY ugly Christmas sweater project from Punk Projects is for the ultimate Trekkie. Spock is featured front and center and says "Trek the Halls." Find a drawn picture of Spock online and then use it to recreate him onto your sweater with fabric paint and glitter. Add any Christmas embellishments that you want to make it everything you want it to be. This is a unique ugly Christmas sweater project like you've never seen before. A plastic bowl and some cheap Christmas decorations are used to create a 3D snow globe on the front of the sweater. Do you have a fur baby who wants an ugly sweater too? 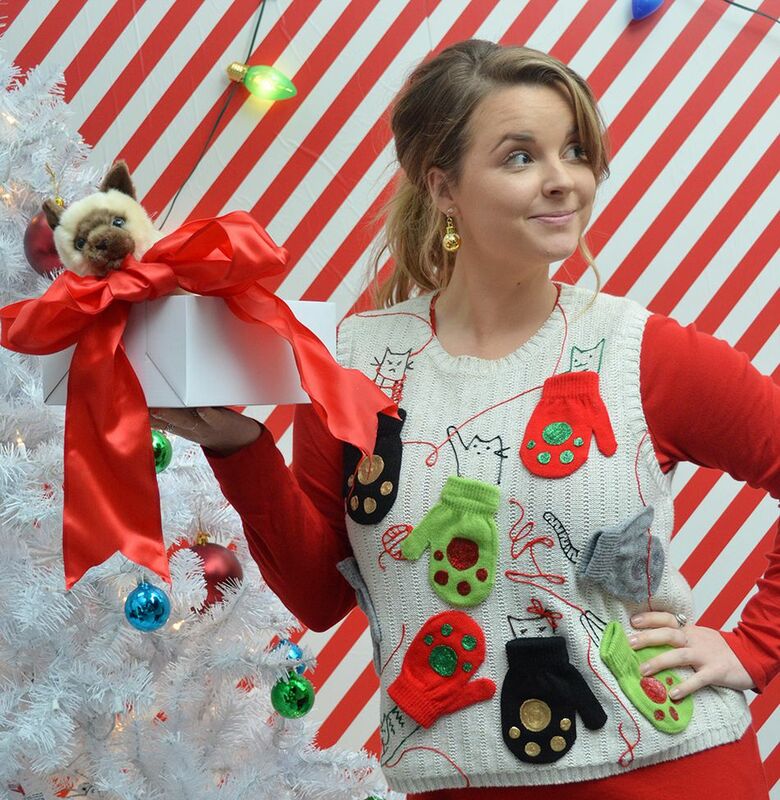 This project even includes a bonus project to make an ugly Christmas sweater for your dog. My Thrifty Chic has four DIY ugly Christmas sweaters project here and they are all under $10 including the sweater and decorations. There's a sweater with a stocking, a wreath, jingle bells and mini stockings, and a Christmas tree. These are fast projects and will take you under an hour to create before you head out to the festivities. This ugly Christmas sweater was made for a man but it really can work on anyone, young and old. A Christmas tree with working lights is made from green garland and colorful ornaments. The tree skirt is the finishing touch and completes the true awfulness of this Christmas sweater. Here's an ugly Christmas sweater that's designed for a kid but would work for anyone. Amy Letta Creations has come up with this felt Christmas tree sweater that you can make as gaudy as you want. An added element is the faux Christmas lights that trail along the arms. You could even add real lights if you want to take it to the next level. This DIY ugly Christmas sweater combines another ugly Christmas tradition, the Christmas tie. The ties are put together to form a Christmas tree with a big bow on the top. You can add as many embellishments as you want to make it even uglier. This is a simple no-sew project that uses fabric tape or glue to secure all the ties to the sweater. If you love reindeer, and especially Rudolph, you're going to love this ugly Christmas sweater project from The Country Chic Cottage. Brown felt, red pompoms, and large google eyes are all put together on a sweater to make a bigger than life Rudolph. This DIY ugly Christmas sweater from Spit Up is the New Black has everything you want in an ugly sweater––lights, Christmas bulbs, and stuffed animals. There's a good set of instructions here on how to attach the working lights to the sweater and hide the battery pack. Biscuits 'N Crazy has come up with this DIY ugly Christmas sweater that's perfect for a couple. Standing together the sweater forms a scene of Rudolph experiencing a Christmas indulgence gone bad. Hot glue attaches canvas, felt, and Christmas ornaments to the sweater, making this an easy project that will get you out of the door and to your party in no time. If you're looking for a maternity ugly Christmas sweater you can DIY, look no further. This snowman ugly sweater has got you covered. It uses an old t-shirt, felt, a scarf, a hat, and some twigs to create the look. Cut Out and Keep has come up with a Christmas sweater featuring the ever popular Grumpy Cat and gives directions on how you can make one too. All you need is a sweater, some felt, and a pom-pom to make the look complete. Diana Rambles shows you how to take a sweater you already have and add a holiday felt pack to it from a dollar store. It's a quick project and it's as cheap as you can get. There are lots of ways you could change and add to this sweater to make it an original creation by you.